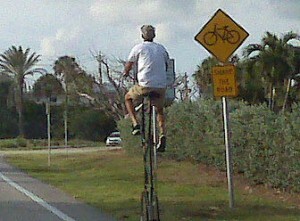 My foodie friend, Jan Norris, sent me this picture of a bike rider on A1A in Delray on Bike to Work Day. If anyone knows the rider, let me know. I’d like to hear his story. He might be a member of the Freakbike Militia, but I don’t recall seeing him on their last group ride. He could be a retired 18-wheeler driver, nostalgic for his former point of view on the road. He could be a drywall finisher. Instead of wearing stilts, he tools around the room on his high bike. He likes to read road signs at eye level. He takes flash flood warnings seriously. He assembled his bike late at night without reading the instructions. Thanks to Jan for the picture and for not running over the cyclist while she was driving and fumbling with her cellphone camera. There were a whole team of riders of high bikes that did the MS-150 from Miami to Key Largo. I don’t remember their club name but there were nearly a dozen of them sporting the tall bikes. I spoke to them at the starting line and they all seemed to be good folk. I think they were out of Broward county, if you’re looking to catch up with them.